Here at That’s What She Fed, we admitted long ago that we are food snobs. Once we get a taste of the ‘good stuff’ be it Komi’s take on the gyro, an old vintage pinot noir from Napa or imported artisanal goat cheese it is tough to go back to eating like a normal person. Recently our snobbery has spilled over into the world of oysters. We have long been fans of the hard shelled filter feeders, happily shucking the local oysters found at the Wharf. However, a recent string of oyster dinners at Hanks Oyster Bar, Pearl Dive and Old Ebbit Grill has left us with a taste for premium oysters from faraway lands like Maine, Massachusetts, Rhode Island, Washington state, and the Canadian coasts. After a couple dozen quality oysters, we were hooked and I began searching DC for premium oysters. The Wharf offers two kinds of what I now like to refer to as ‘working man’s oysters.' There is the generic unnamed local oyster whose size ranges from silver dollar to a size 4 Manolo Blahnik and contents often include pesky oyster crabs and Chesapeake sludge. And there is the Chincoteague, a solid oyster for the uninitiated but for those of us with a refined palate the Chincoteague is more or less the Olive Garden of bivalve mollusks. If you can find oysters at a supermarket, they are usually of the same local variety found at the Wharf. The selection is a little better at Whole Foods. They tend to have a limited supply of oysters from Virginia and Long Island, but their tree hugging local sourcing practices prevents them from flying in the good stuff from colder waters. I am told Wegmans usually has some quality oysters, but we haven’t been out there in a while. Since DC is a transient city and more or less devoid of the butchers, delis, and specialty food shops traditionally found in other cities, finding a source for good oysters was not looking promising. 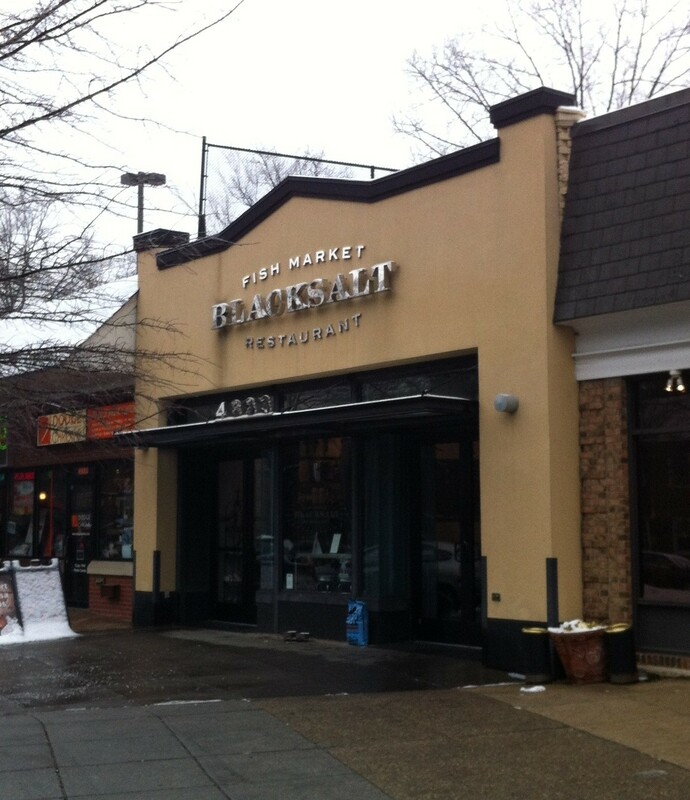 I have known for a while that in addition to serving some of the area’s best seafood, BlackSalt also operates a high quality fish market in the front of their restaurant. However, I had been hesitant to make the four mile trek from Logan Circle all the way out to their location in the Palisades, a Metro no-mans-land (especially on the weekends) north of the Georgetown Reservoir. But a bro night at my friend’s new place was the perfect catalyst to make the journey, after all I didn’t want to arrive empty handed on lamb shank night. BlackSalt’s operates by far the most high class fish market that I have ever seen, a reflection I'm sure of their local clientele. A wide variety of fish, mostly wild caught and mostly over $20 per pound, is laid out in a pristine arrangement on ice. They offer everything you would expect from a fish market, from littlenecks to whole lobsters, with a higher quality and a higher price tag than most other fishmongers. When I visited, BlaskSalt had about 20 varieties of oysters from all over North America listed on a small chalkboard. Their offerings change daily depending on what they have in. At long last I had finally found my source. The staff was very helpful, patiently waiting while I surveyed the list and individually bagged and labeled each variety from my modest order, which can be viewed above.